A beautifully simple game that can be played by everyone, in any garden where a ball will roll. Hand-made in England, the game comes with an easy to wheel trolley bag and includes 4 hammers, 4 wooden balls, 6 hools [the three way hoops that you shoot through], 6 pins, 4 markers, full instuctions, a set of Crolf Laws. called it 'Cross country croquet' and that is about right. It can be played by as many players as you want. It has only nine laws. 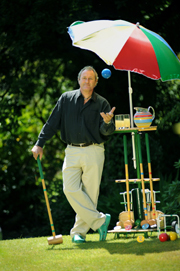 CRolf: Just place the 6 HOOLS [three way hoops] anywhere in your garden to form the course and you are ready to play. 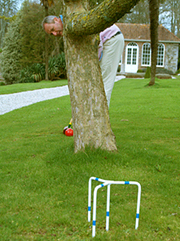 New Pin CRolf: Just place the 6 Pins anywhere in your garden to form the course and you are ready to play. They can be for as many players as you want. Full set: £399.50 including delivery within the UK.